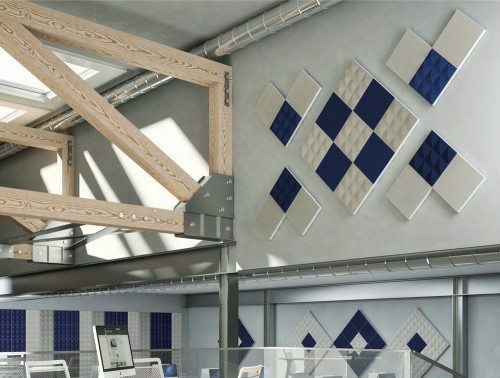 Noise pollution can sometimes be a problem in many offices, especially open plan designed workspaces which has been adopted by many of today’s modern businesses. 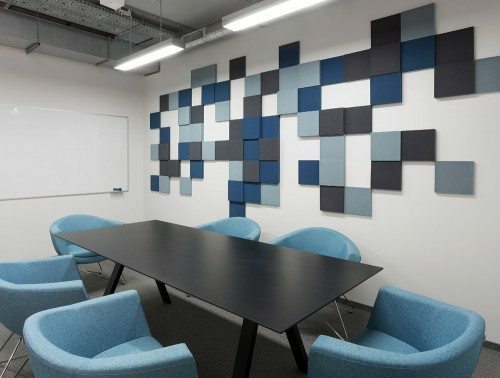 Acoustic soundproofing panels are an effective solution to help reduce noise reverberations in places where you wish to keep noise levels to a minimum such as open offices, conference rooms, canteens and breakout areas. 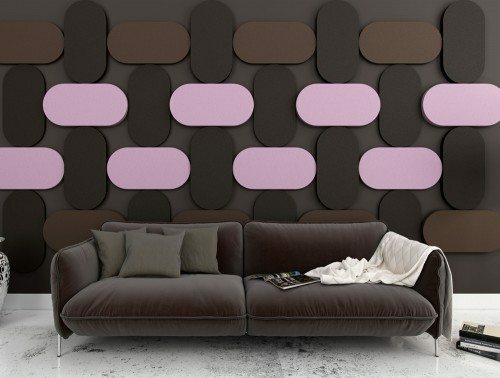 The acoustic panels can also be used in public places such as gyms, schools, auditoriums, hospitals and more! 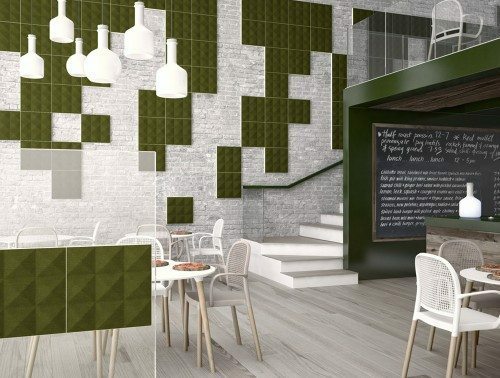 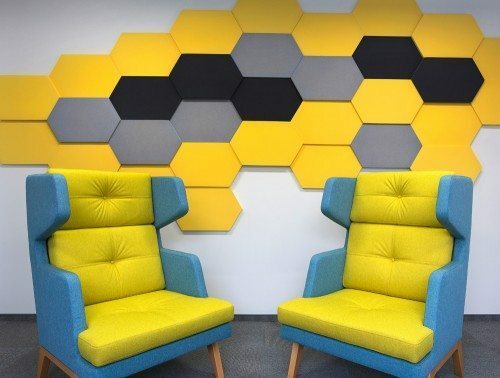 We source our range of affordable acoustic panels from some of the industries leading suppliers including Fluffo, Hush and Gaber. 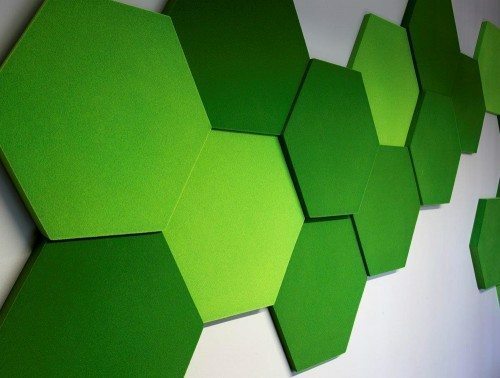 For an environmentally friendly solution, choose from our range of Soundtect Eco-panels. 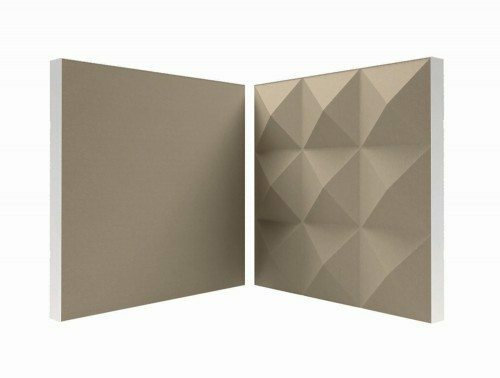 These acoustic foam panels are created with up to 70% recycled polyester fibre whilst still offering fantastic sound absorbing functionality. 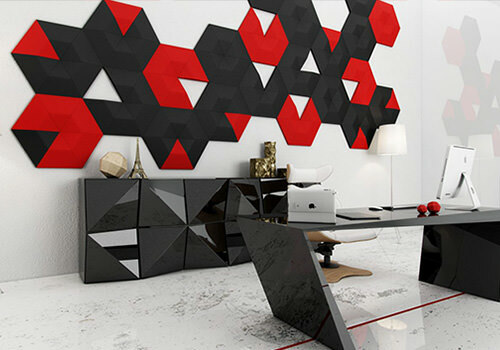 We have a diverse selection of different designs in our catalogue. 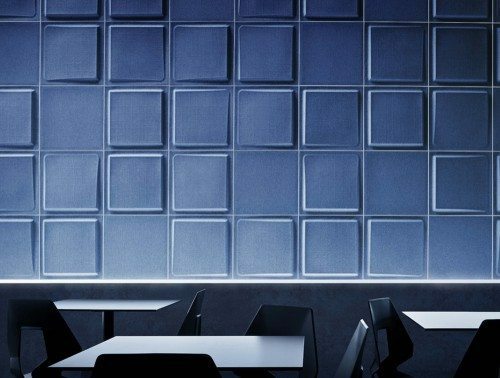 Choose from acoustic wall, ceiling and hanging panels offered in a wide range of different shapes and sizes. 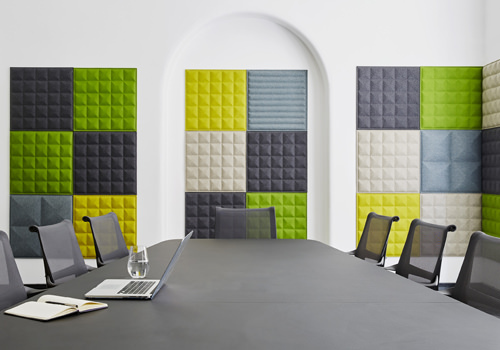 The noise reducing foam panels are offered in beautiful vibrant colours including popular green, yellow, blue, grey and white acoustic panels to best suit your office décor. 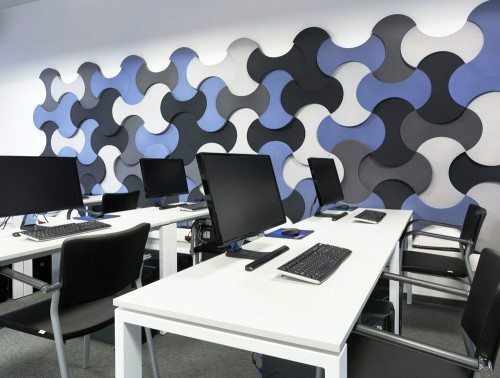 The acoustic solutions for sale feature a highly innovative design which boasts highly absorbent noise properties as well as being fire resistant made with flexible, dense polyurethane foam. 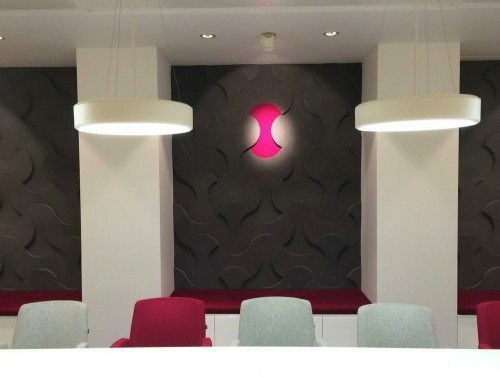 A selection of the hanging panels can be fitted with stylish spotlights which offer extra functionality. 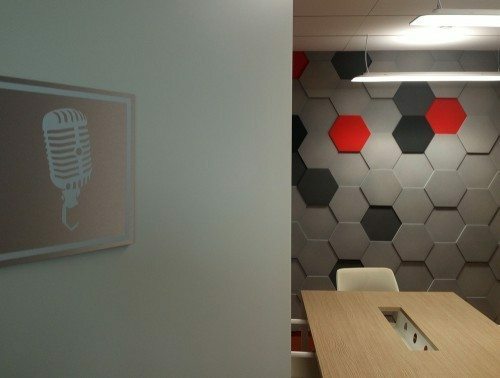 Our range of acoustic solutions has all been tested thoroughly to ensure its quality and functionality meets the highest level of standards required for home and office use. 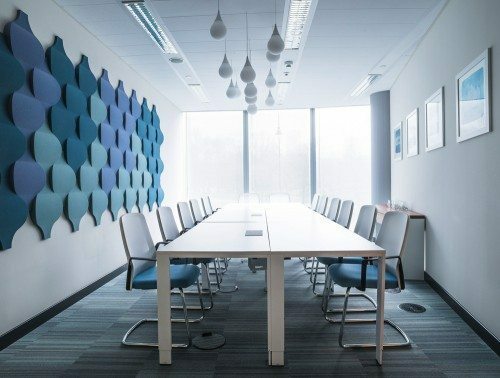 Noise distractions such as echoes and little chit chats that occur in the office can affect employee performance, leading to a decrease in overall productivity and output levels, which can cause a negative outcome for your company in the long run. 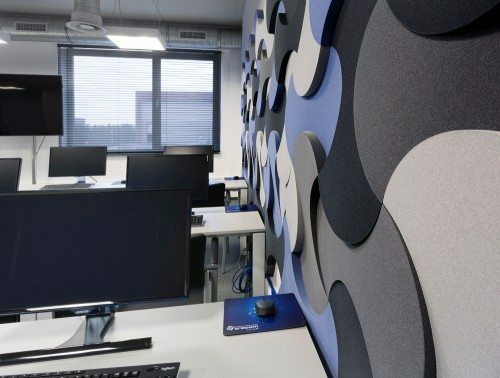 Did you know that employees lost as much as 86 minutes per day due to noise distraction? Create a quiet and cosy atmosphere with our range of office acoustic panels. 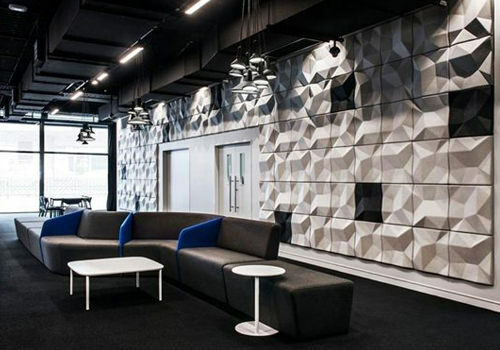 The powerful acoustic solutions absorb noise reverberations which will induce a quieter space for your employees. 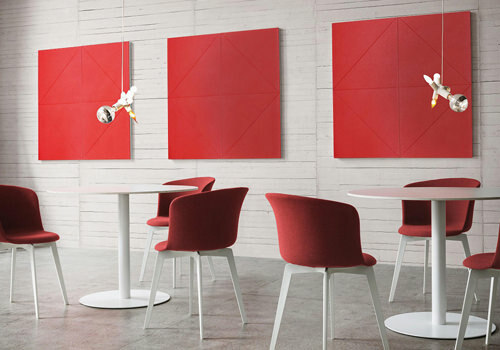 Their high-quality and flexible design allows you to install them anywhere you wish! 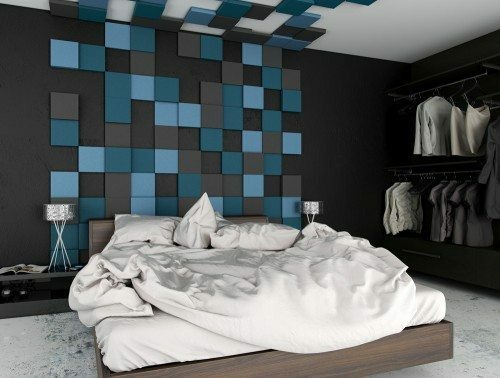 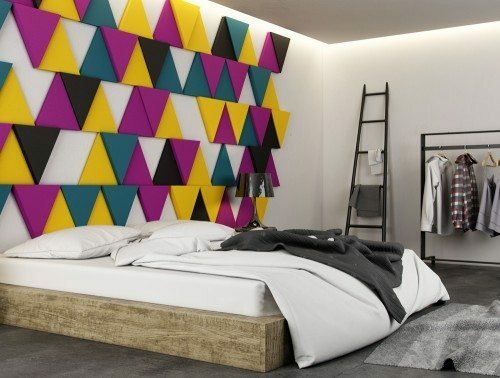 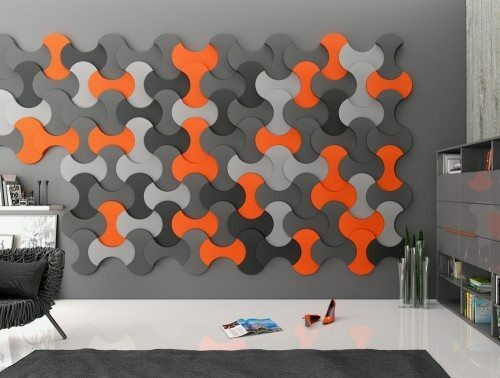 As well as offering acoustic properties, the 3D acoustic panels are great for decorating blank office walls. 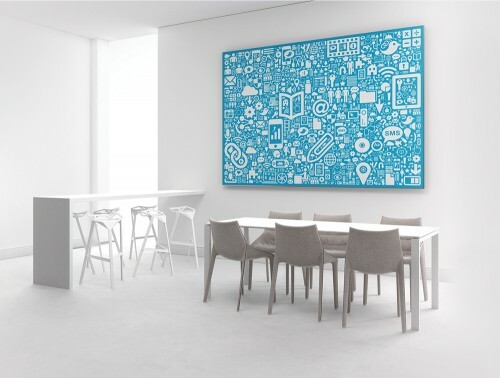 Offered in many shapes and sizes, you can create endless amounts of wall arrangements to suit your company’s personality. 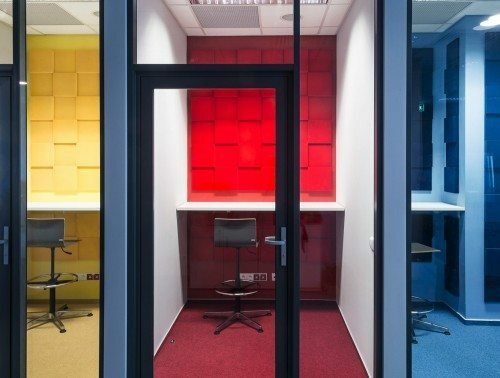 The colourful wall panels will transform your ordinary plain office walls into a stylish and inviting space which will truly impress anyone who walks into your building! 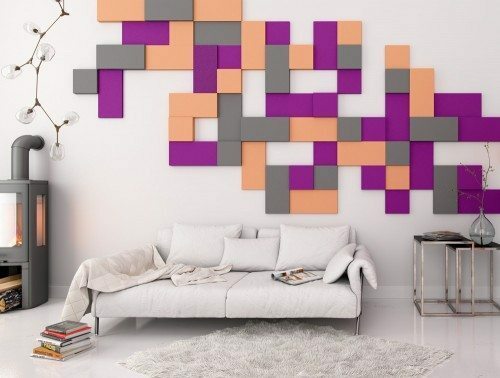 If you are wondering how to mount acoustic panels then there is no need to worry. 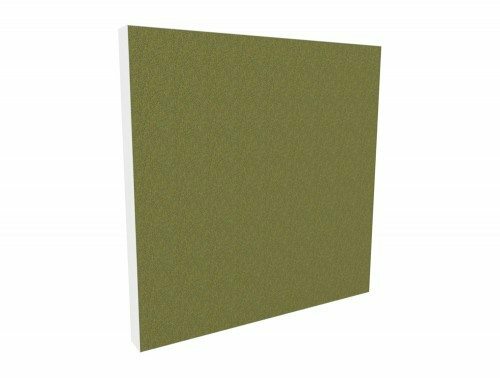 A wide selection of our foam panels can be easily installed with a thin layer of adhesive that is quick and simple to use. 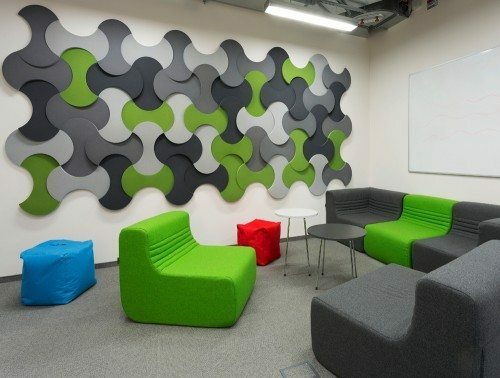 Our range of splat shaped wall and ceiling panels are a popular choice for creative spaces such as primary school classrooms. 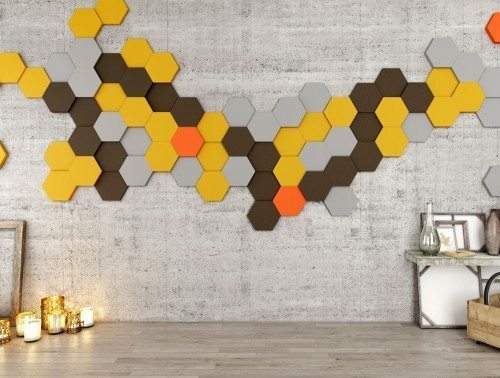 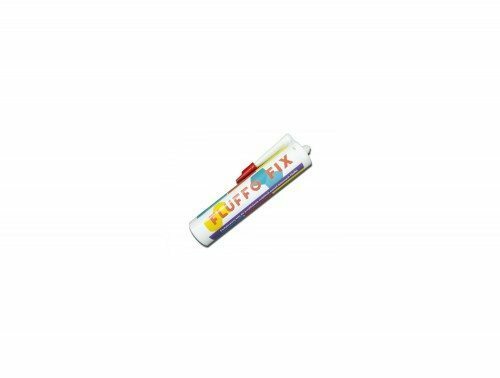 The funky shape, which comes in a variety of colours matches the children’s imagination and creativity. 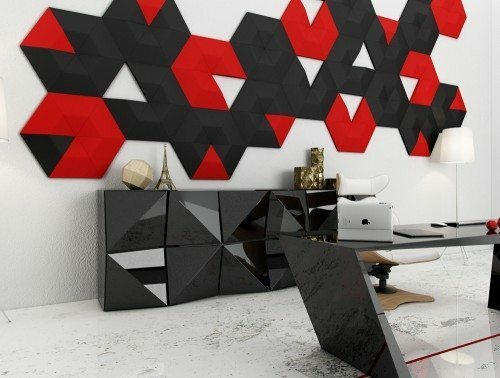 There is an endless amount of possibilities when it comes to patterns and sizes. 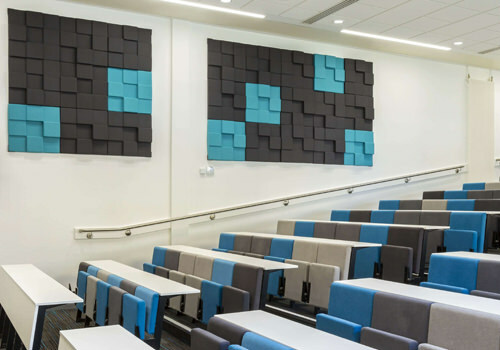 For gyms and auditoriums, you can create large sizes of acoustic wall panels to help reduce the echoes that travel across a large open space. 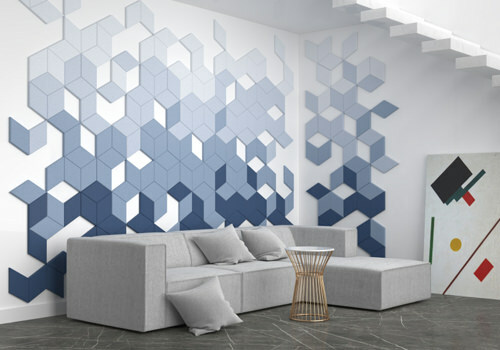 If you require assistance in designing a wall arrangement, our skilled design team can guide you into creating an acoustic wall panel design to best suit your space, just give them a call and they will help bring your vision to life. 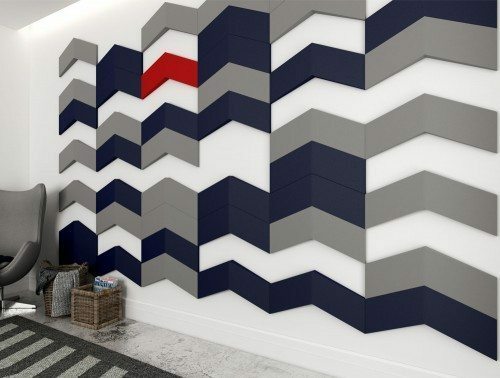 If you’d like to find out more about our range of Acoustic Panels or discuss your requirements, simply request a callback.